The viral Facebook sensation Susie's Senior Dogs has amassed over 500,000 fans as it advocates for the adoption of elderly dogs. 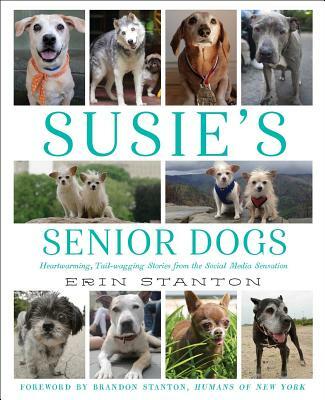 Now Erin Stanton (Susie's owner) has written a heartwarming, compelling collection of "happy ending" adoption stories for our oldest and dearest canine pals. In this collection of success stories culled from the nearly 500 matches SSD has facilitated, Erin Stanton—and Susie—talk to dozens of adopters who've learned what a perfect companion a senior dog can be. From Rudy, the 12-year-old Puggle who's a calm and sturdy first dog for two young boys, to Rocky, the shy German Shepherd who now escorts his owner on daily walks around their ranch, Susie's Senior Dogs celebrates dogs from all walks of life. And of course, we'll hear Susie's own story woven throughout! Featuring both internet "dog stars" like Chloe Kardoggian and Wolfgang, as well as brand-new, never-told stories of senior dogs getting a new lease on life, Susie's Senior Dogs will keep readers smiling and tails wagging! This beautiful, upbeat book includes sidebars, Q&As, "Susie's Top Tips" and more, making it the perfect keepsake for animal lovers of all ages. Erin Stanton is the human behind the Facebook and Instagram sensation Susie’s Senior Dogs, which has over 400,000 likes on Facebook. Susie’s Senior Dogs is a nonprofit organization dedicated to finding homes for senior dogs all across the country.